In management research, we usually need to create a variable that measures the experience of firms. Firms accumulate experience as they make acquisitions or invest in companies in certain countries. Sometimes this experience has an effect in future decisions, so we calculate variables that measure the number of times a firm has made an acquisition or has invested in a certain industry or country. In STATA, this can be done using the command –bysort– and –gen– (i.e. –generate-) or –egen-. In this post I will calculate an experience variable using a fictitious dataset. Consider the dataset shown in the figure below (Table 1). It has 4 variables: Firm, Country, Year, and Investments. The dataset describes the amount of investments a Firm has made in a Country each Year. The variable Investments is non-negative. In this case, firm’s experience is the number of investments a firm has made in a certain country until a certain year. Therefore, in order to create the variable ExperienceCountry (column 5 in Table 2) we have to sum the investments a firm has made in a country from the first to the current year. We do this using the –bysort– and –gen– commands. The –bysort– command sort the observations using the variables Firm, Country, and Year. The result of that order will be two groups of observations: Firm A and Firm B. 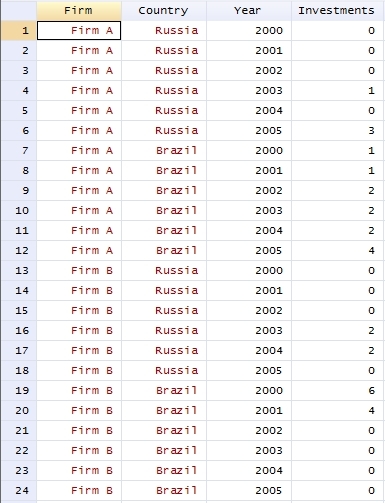 Then, since we are sorting by Country, we will have two subgroups within each group: Brazil and Russia. Finally, within each country, the observations will be sorted from the first to the last year. We will be summing the investments made by each firm in each country during (only) each year. Given that we only have one observation for each year per each pair Firm-Country, we will only get the same value of the variable Investments. 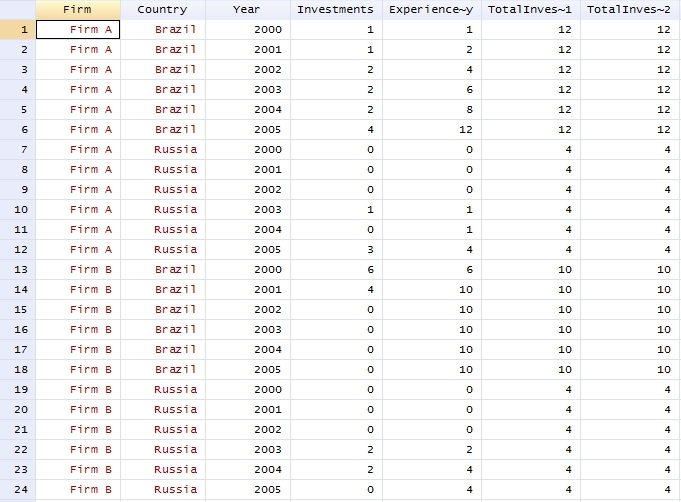 In this case, we are summing all the investments made by a Firm in each Country across all years, and then we are creating the variable TotalInvestmentsCountry2 that has the same value for every row of each unique pair Firm-Country. If you want to play with this dataset, you can download and MS Excel file (.xls) with the data from here. This entry was posted in How To, STATA and tagged howto, STATA, STATA/bysort, STATA/egen, STATA/gen on May 24, 2013 by Francisco Morales.